When Seejo’s parents visited us for about 10 days in late October, we wanted to make sure that they could see the fall colors that we all enoy so much. Unfortunately , their trip was timed at a point where the fall was winding down in New England and even in Shenandoah. Therefore we decided to go south to Smoky Mountains to see the fall colors. I think that was the best decision we ever made. Look at the colors here and tell me you disagree. We just returned from a wonderful mini vacation trip to Glacier, Yellowstone National Park and Grand Teton National Parks with family. As is the norm, I was sorting and uploading the wonderful photographs that Seejo took with our new Nikon Digital SLR camera, I noticed something unusual. There was just one photograph of a food item— definitely unusual by our standards. A tall glass of purple colored huckleberry lemonade that we had at the Huckleberry Patch in Montana. For us, one of the yardsticks for a successful trip is being able to sample a new cuisine or an mouth-watering dish at an unexpected location. We have actually considered a trip to New Orleans for being able to eat the famous charbroiled oysters at Dragos in New Orleans. Our mouth still waters at the thought of the grilled shrimp that we polished off at Wahini Surfer’s Grill at Outer Banks, NC. Despite having our fill of lobsters in Maine, what I remember is the wonderful egg-vegetarian breakfast (chilled melon soup garnished with bright yellow nasturtium flowers, warm pear almond bread and wonderful omlettes) that was served at the OceanSide Bread and breakfast Inn at Schoodic Peninsula. I still recommend to out of town guests to visit Buddy’s at Annapolis just to have some outstanding crab –both crab cakes and bisque . I know that when I next go to Austin to meet family, I will insist on having the spicy fish tacos from Taco Deli , when I go to Philadelphia I will make a stop at the Jim’s steak house to have the famous Philly Cheese Steak and when I travel to Chicago, I’ll be buying some Garret’s cashew nut popcorn. I don’t know the point of writing all of this. All I know, I am eagerly waiting for my next trip—to explore a new place and to discover a delicacy that I have not yet tasted. In August both DC & Bethesda had their restaurant week. During restaurant week, participating restaurant offer a fixed price dinner (~$ 35) and/or lunch (~$20) to all its patrons. Some restaurants offer a special menu, sort of an abridged version of their regular menu for restaurant week while others offer their entire menu (with some items having an extra fee). It is the time, Seejo and I look forward to –because that is the time we get to visit restaurants that we would normally consider as above our budget. Last year we went to Acadiana- a New Orleans style restaurant. The restaurant was crowded—restaurant week tends to get crowded. But we had a wonderful turtle soup as appetizer, an amazing roasted duck with a sweet crispy skin and an amazing drink called Basil Belle—Tanqueray gin and lemon syrup/lemon soda and crushed basil. It’s a drink we have made several times at home afterwards. This year, we indulged in three different restaurants, beginning with Tavira , a Portuguese restaurant, for the Bethesda restaurant week. The dishes were picked off the restaurant week menu—very disparate in style and proportion. The Piri Piri chicken was grilled perfectly and , unlike most grilled chicken, the spices had permeated throughout the chicken and the quantity was enough for even lunch next day. On the other hand, the grilled sea-food presented very artistically but it was rather bland and the quantity was rather meager. It was same with the appetizers too—the sardines were surprisingly good (even for a confirmed sardine hater like myself), but the kale soup was luck lusture. Overall impression: I’d recommend the restaurant if you are in the vicinity –not if you have to go out of your way to eat there. For the DC restaurant week, we picked two very different restaurants. A French style bistro “Bistro Bis” where they offered a limited restaurant week menu. I had my first steak tartare which was “interesting” but the act of nibbling at a raw cow makes me a little edgy. The mussels were amazing but the start of the party was hearty and spicy beef stew. The duck confit was surprisingly flat. The trio of sorbet was just the most light dessert to finish off the meal. Overall impression: Nice but not worth the price. The best restaurant that I have ever visited, in terms of food alone is Farrah Olivia by Morou. We have wanted to go there eveer since we saw Chef Morou in Iron Chef America. What they serverd was not just food, it was almost an artistic creation. The appetizer we ordered was scallops and gazpacho. The scallop was seared perfectly, and served with melon puree lined with berebere oil with a little bacon powder and bacon bits on the side of the plate. It was probably the best scallop I have ever had. The gazpacho was presented beautifully—both tomato and eggplant gazpacho served in the same plate with a mint jelly and chilli jelly cube floating in each side respectively. There were combinations that I never thought would work together such as a banana crusted chicken with mango sauce and quinoa salad which had me wondering why didn’t I ever think of using banana and chicken before . Seejo’s entrée was steak but it was served with raisin sauce and a cocoa-coffee powder and sauted mushrooms. The server explained that you mix the powder in the sauce and the dip the steak into it. Individually each of the items were good but together they exploded into something magical in your mouth. The portions were small— it did take three full courses to make me feel full ( we licked the plates clean each time). But each dish was unusual, disparate ingredients that blended together so well, presented beautifully and extremely delicious. Overall Impression: Going there again, Definitely. And we are not going to wait for the next restaurant week. This was my fourth trip to West Virginia. 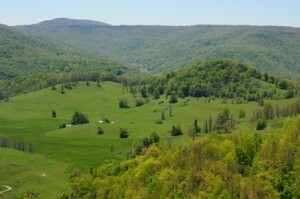 The first time, it was a spur of the moment weekend trip when I was in U.Va. We went horseback riding and stayed in a remote log cabin with absolutely no contact with the world. The second time as even more adventurous; we went white-water rafting with a bunch of friends and came back tired and exhilarated. The third time was leisurely trip to Summersville with cousins and visiting aunts and uncles. It was a relaxed picnic kind of trip. This time it was a trip to the mountains for some rustication. We found ourselves a little house on top of a hill with an incredible view . It was kind off odd—because other than Ashu, the others (Ashu’s fiancé Shweta, her brother Siddhu, another Ashburn couple—Nikhil and Suman and one of their friends Kumar) were strangers to me & Seejo. Infact we were meeting with half the group pretty much for the first time. Some times the trip is about the destination, some time it is about the activities , sometimes it is simply the journey. At other times, very rare though they are—its just about the people, strangers who become friends and make a trip very memorable. That’s what I shall remember of this West Virgina trip….the tiny house on top of a mountain, with a view of the expansive green valley below and some strangers who became friends on that mountain top and had a grand time of it. Anyone reading my scribbles will undoubtedly think that all we do is travel to some place, take lots of photographs and then write about it here. And if they do think so, Amen to that. This Sunday we went on a day trip to Longwood gardens near Philadelphia . Now, I have been meaning to go there for a few years but given the seasonal limitations in touring gardens, it never panned out. But this year, I was determined to make it this time, the spring blooms festival was going on and I didn’t want to miss it. We started bright and early (for a Sunday, that is) at 9 am along with our friends Ajith & Lakshmi and their super-friendly kid Adithya to Longwood—about 2 hours drive away. Longwood gardens has about 1000 acres of parkland of which approximately 300 acres are open to the public. These contain several outdoor gardens and a some indoor gardens including hothouses and conservatories. In early 1900s, Pierre Dupont bought this land from the Pierce family: a Quaker family, who were owners from the late 1700s. They had already planted a small arboretum on the land. Peirre du Pont probably was delighted with the arboretum and he wanted to make sure that the gardens are preserved for the future. He and his wife were keen horticulturists and developed the gardens, often getting ideas and seedlings from the various places around the world. The gardens have always been open for the public to enjoy. We had a picnic lunch where we ate the unusual but wonderfully tasty combination of spicy fish wontons, caprese salad sandwich and some mouthwatering chaat. We then walked off our heavy lunch by touring the outdoor gardens. There were several gardens each of them uniquely designed and each one of them more beautiful than the previous one. The tulips were in full bloom at the flower walk, there was the symmetric Italian water garden with several fountains, vast meadows lined with gigantic copper beech trees, a topiary where evergreens were trimmed to create whimsical shapes, a waterfall, lakes, a tree-house and an idea garden for those who wanted to carry off a tip or two to try in their own gardens. By the end of the day, our legs were tired from walking all throughout but we still couldn’t tear ourselves away from the gardens. I was a little worried at the beginning of the trip, if the gardens would live upto the expectations that a two year wait created. But I needn’t have worried, after all good things come to those who wait!! It is rather difficult to write a travelogue about a trip that was undertaken some time agao. The mundane details of the time you woke up, what you ate for lunch or the various “must-see” locations that visit each day get merged with each other and lost in the mists of memory. What remains are those shining moments that truly make the trip memorable. Perhaps that is the best way to write about any trip. Wait for a while, till the real memories surface. But even while delving into memories it is best to have a rough framework of what we did. When we started planning our India trip ( which starts right after we return from the previous one ), I was determined that this time around, we would take a mini vacation while in India and visit some-place we haven’t been to. I picked Rajasthan as our vacation within a vacation spot. It had always ranked high on my must-see lists, and this time I was determined to go there. When we started researching Rajasthan ( Per Seejo, every day of vacation requires at least 3 days of good quality research ), there were so many places to choose from. There were plenty of online guides and recommendations —given that Rajasthan is probably one of the most popular tourist destinations for non-Indians. 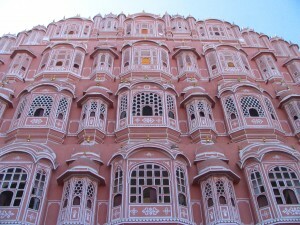 Jaipur was a given, it being the capital city ( and the cheapest city to fly into ) but how do we pick the others? Should we go to Jaisalmer? Should we pick Ajmer or Bikaner ? Jodhpur or Udaipur ? Can we fit in Sawai Madhopur in the week that we have? All these questions needed to be pondered, debated, researched and answered. After a long drawn process, this was the route we picked. Once that was decided, booking the hotels and a car to take us around was fairly simple. My mother contacted Tirupati travels and they booked the hotels at Bikaner , Jaisalmer and Jodhpur ( they gave us a choice of few at each destination, we picked the ones that seemed ok and then they confirmed the booking for us ) and also arranged an Inova with a driver for us. The itinerary was rather relaxing, compared to our usual mode of travel. We were to land in Jaipur, and spend two days there and go from there to Jaisalmer, stopping at the Shekhawati regions and Bikaner for a night. After a day in Jaisalmer, we would travel back east to Jodhpur for a day and half and then to Jaipur. The driver was waiting for us when we landed in Jaipur airport early Saturday morning and took us to the RBI officer’s guest home in Jaipur. Dwiti and I loved the previous experiences at the holiday homes where a resident chef had cooked mouth watering dishes for us, while we rested in plush suites. Somehow that memo hadn’t reached the Jaipur office. The rooms were barely clean, the cupboard was bare, the bed linen was missing and there was no friendly resident chef. Anyway we were here to see Jaipur, so off we went. We were just starting to complain of not seeing any pink buildings when we reached what must have been the Old part of town and the pink (or orange-pink) sand stone structures sprung up from all directions. The City Palace was large but did not leave a striking impression—what remains in memory were the 1.1/4 flag that was flying on top of all buildings representing the Sawai (one and a quarter) dynasty. The flag would be flown at full mast only if the present Maharaja of Jaipur was in town. The Jantar Mantar Observatory was interesting and The Hawa Mahal- the face of Jaipur- was quite unremarkable, the only remarkable fact being that the outside façade is only one room thick….something I did not gather previously from seeing the pictures. The other places we saw in Jaipur included the Amer Fort, the focal point of which seemed to be fact that it was a residential fort as opposed to the nearby smaller Jaigarh Fort that was a military fort. Amongst all the history of Jaipur that we heard that day, all that I remember is that the Kings and Queens used to flee from the residential Amer fort to the military protected Jaigarh fort whenever there was an invasion. But the memory of Jaipur will always be Chokhi Dhani—an extremely touristy but well laid out model of a Rajasthan Village complete with free mehendi artists, camel rides, Ferris wheels, swings, and a troupe of folk dancers. There were many raise platforms that served as makeshift stage where these dancers performed the local dances, a magician performed card tricks and an astrologer with a parrot read your fortune. It was very clichéd, very touristy but it was great fun! The star attraction, though, was the food- served in traditional style: serving utensils were plates made of leaves and earthenware glasses and the eating style was sitting cross-legged on the floor. And the servers urging us to “ jeemon, jeemon” as they served the various dishes and poured ghee and sugar over the yummy moong khichdi as though there was no tomorrow and no heart disease. And to end the day, my father in law trying to wash his hands with fennel seeds, mishearing the “saunf” that he was served, post meal , as “soap” and thinking that it must be a local soap substitute. We drove to Bikaner & Shekhwati after two days in Jaipur. I must tell you about our driver-Kailas. He was a good driver in terms of his driving skills- steady, cautious and without unnecessary jolts and with an eye on the speed limit. He even won Seejo’s rare stamp of approval. But the guy rated a zero on his social skills; he was withdrawn, morose and did not know what a conversation meant. He would stop the car suddenly, open the door and walk off and we had to figure out that the reason for him stomping away was “It is lunch time, I am hungry. Eat if you guys want to, but I am ready to eat here at this dhaba”. By the end of the trip, we were accustomed to his stops; in fact on our way back, when Kailas stopped the car and rushed off, we were all ready to spring out of the car till we realized that he had actually stepped behind the bushes for quick relief! Anyhow, the Shekhawati region with its painted Havelis was quite the highlight of the entire trip for me. 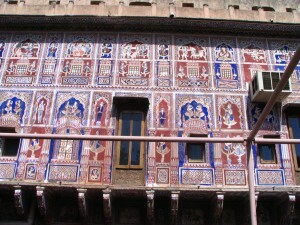 Several havelis in this region belonging to the rich and influential traders of yesteryears had been painted with elaborate designs all over. When I mean painted all over…that is exactly what I meant. The exterior of the house (even the support columns that hold the parapets), the floors inside, the ceiling, the walls—every available surface has been used as a drawing canvas. Only the basic naturally available colors have been used but the design ranges from nature scenes, mythological figures, prominent Hindu & Mughal men and women. The descendents of those art loving traders who live in this havelis now cannot afford the upkeep and so the designs have faded away and there is an atmosphere of shabbiness that is very prevalent. But amongst the entire general derelict, there are a couple of houses that showcase the original grandeur of these painted havelis. One of them, ironically called “Angrez Ki Haveli” is actually owned by a French artist, Nadine (something). We were shown around the house by a talkative local girl –Shabnam who switched between Hindi & French effortlessly. The house was beautiful, and actually lived in by Madame Nadine who used the upstairs bedrooms & the kitchen & laundry room etc. She has spent upwards of crore trying to maintain these havelis. Each façade is painted as soon as there is a hint of fading by local artists, infact we saw a couple of lads who were hard at work outside refreshing the paint. They were descendants of the original artists in the area “yeh kala to khoon mein hai”, was their statement. I joked that if my mom knew painting, even I might have inherited some artistic taste, the response was quick “ Hamaari dadi thodi painting karti hai…aap khana banana to zaroor seekhi hogi apne maa se ”. I knew it was time to shut up and leave. We also stopped at another painted Haveli nearby, which was smaller in size and recently restored by the Singhania (of Bombay hospital fame) family. The Haveli was open for tourists, Singhania family also owned a “modern” bungalow opposite the painted haveli, where the family stayed for a couple of weeks a year. We visited the Junagarh fort at Bikaner (nice but not special) and stayed that at night at Haraser Haveli. Many hotels in Rajasthan are old havelis that have been converted into hotel rooms. One of the highlights of the trip was staying at these hotels. Most of them had all the modern conveniences you expect in any good hotel, offered free breakfast : good hearty parathas or Alu-puri , cutlets, pohas in addition to normal continental fare. Every single hotel we stayed at was a find and is highly recommended. The wonderful and beautiful Jhalamandgarh at Jodhpur or the food service & location of The Hotel Moonlight in Jaisalmer—right opposite the grounds where the annual Jaisalmer festival was going on. When we reached Jaisalmer and checked in the tiny entrance way of Hotel Moonlight, we were excited to discover that the annual Jaisalmer Desert Festival held for only 2 nights a year started that night and was about to start in the maidaan exactly opposite to our hotel. Dwiti, Seejo and I crossed the road to listen to Vasundhara Das sing, watch kids enjoying camel rides and also catch a glimpse of the beautiful and aptly named Sonargarh fort lit up in the nightlights. We also caught a glimpse of Mr. Desert 2008 (lucky lucky me), who twirled his moustache for us and posed with me for a photo! 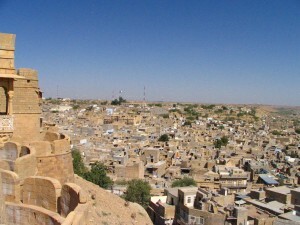 The Sonargarh fort in Jaisalmer is a “living” fort…about 300 families still live inside the walls of the fort. Inside there is a famous Jain temple….where rows of similar looking Thirthankar idols were placed, each of the 24 being identified by a symbol at the base of the idol. We roamed a little in the main market region of Jaisalmer – very colorful and stopped to see the various Havelis in Jaisalmer. The highlight of the Havelis were that they were multi-storied structures (the Patwon Ki Haveli which is almost like 5 townhouses joined together had about 4 floors + main floor) and had elaborate carvings on the exterior sandstone structures. These havelis belonged to the King’s ministers and one of them even had the roof paved in gold. Another interesting thing that we noted as we roamed the bylanes of Jaisalmer was that wedding invitations were painted on the main wall of the house proclaiming the wedding of X with Y. Per our guide, they stay there till the next wedding in the family. We spent a lot of time looking at these wedding logs and noted a wedding anniversary was just over for a8 year marriage and that there as a wedding in one house in two days time. Very Fascinating! “dansodinar” (Dance aur Dinner) and then rode away at full speed. We found a place that got us some solitude, sat on the sands and watched the sun set , sand dunes change color as the sun was setting and then walked down to our desert camp for the night. The folks at Hotel Moonlight had arranged a desert camp night for us, complete with music, bonfire, dancers and food. It would be weird if I wrote all of this and didn’t mention the local food in Rajasthan. My in-laws are amongst the least adventurous people in the world and they are especially timid when it comes to food. They preferred eating in “bigger” and so safer hotels, examined each entry from multiple angles before nibbling a bit and sighing “ What a pity, we can’t have dosa”. On the other hand, my mother & sister , Seejo and I relished each and every morsel, enjoyed the roadside dhaba food and ate the Rajasthan I fare with gusto. The local dishes like Dal-baati choorma ( a hard baked wheat ball that is crushed , with dal and sweet choorma added to it with a helping of ghee ) , the gatta ka saag ( besan flour dumpling dish ), ker sangria ( some sort of desert green beans ), kadhi pakodi and of course kachoris , bajra rotis. were all excellent. Most of our breakfasts were the absolutely delicious parathas (alu, mooli or mixed) and the ubiquitous poori bhaji or cutlets. We slept in comfortable tents that night and woke up early morning and walked up the desert to see the sunrise. The sand dunes were only restricted in a finite are which was rather different from what I had thought—in my mind the desert sands would stretch as far as the eye….here the sand dunes were surrounded by areas of sparse but bushy vegetations where endangered deer and other such animas roamed freely. Camels were everywhere, the standard mode of transportation for the locals, popular with tourists and we saw them on roads on the way to Jodhpur ambling along on the side of the road paying scant attention to the cars or the loaded trucks ( they were a sight unto themselves—carrying load that was about three times the size of the truck). At Jodhpur , we saw the Meherangarh fort (a fort carved into the mountain rock and the former residence of the Maharajas of Jodhpur), the Ummaid Bhavan palace (the current residence of the Maharaja), the Jaswant Thada ( a final residence or burial ground of former kings) and the panoramic view of the blue city of Jodhpur . The houses are whitewashed with “neel” to keep the houses cool and ward off insects. Each house individually only displays a slight blue tinge but looking from top of the fort, the entire city looks like a sea of blue. That evening we also visited the Bishnoi Village – Bishnois are tribal villagers who believe in safeguarding the local wildlife. They came into prominence when they sued actor Salman Khan & co for shooting an endangered black buck. One of the villagers guided us for a jeep safari of the village. Deer & peacock were plenty , the villagers provide them with water and allow them to graze on their land, driving them off periodically. We also saw the rare Black Buck in the distance at the drinking hole. And we also visited the village potter and tried our hands at pottery— the toughest part of which was getting the pot off the wheel without squishing it completely! I am going home after two years–the longest continous time I have been away from home, despite being in the US for the last 8 years. The suitcases have been packed for the last three weeks, re-packed several times more. weighed repeatedly in a frantic attempt reduce the last 1 pound. Like all previous occassions, this time too there are a few gifts that won’t make the trip with us, our bags are already overweight. We clutch “to-do lists” and check lists wherever we go just to be sure we are not forgetting anything. Stop the mail–check. Arrange with a friend to water plants–check and so on. From couting months to days …i am now counting in hours. I can almost smell the sweaty air of Bombay. I am almost there…..
Two interesting incidents happened in my Epidemiology workshop class today. • The instructor asked us how many of us had kids. I was the only one among 15 students who did not have one. I have been the only one without kids amongst family get together, community gatherings, office parties but this was the first time amongst a group of students in a classroom. Add some more to the list of life’s experiences. To continue the trend started last year, I present my highlights of the year 2007. Discovery of the year: The romance with my work-place has finally ended. Although I continue to cherish my work, the all encompassing passion that I felt for the company has gradually faded. Like I explained to couple of my friends: “ The love has gone out of the marriage but we are still together for the kids ”. Travels the year: Travels started slow this year, with almost no trips for the first half of the year, save a day trip to Maryland ’s capital city- Annapolis . We more than made up for it in the second half of the year with a wonderful long weekend by the sea at Outer Banks, NC followed by a 4 day trip to Oregon and rounded the year off with a week-long RV trip to New Mexico and Arizona. October- November was the most traveled month of the year and included a quick trip to Austin for Michelle’s first birthday, a weekend trip to New Orleans (with a pit stop at Atlanta) for a friend’s wedding and the usual Chicago visit for the RSNA. Achievement of the year: I finally completed compilation of our family tree….translating it from Malayalam and inputting all of the data into a family tree software. With some help from Seejo, we also launched the mamasa.org ( www.mamasa.org ) website. Although started in 2006, it was completed only in 2007! Fresh Start of the Year: I have started studying again and am taking a few courses at Johns Hopkins School of Public Health. It has been quite a process trying to manage both a hectic work schedule and coursework with regular projects, assignments and lectures. Especially if you have not been used to attending lectures for the last 7 years. But it is much easier to study something when you are actually “living” your education. I am almost having fun— except for the assignments! Realization of the year: Last year in my twenties. Nothing more to say. Summary: Could be better ! I wish all of you a wonderful 2008! • Ree , Litty and Mia pick us up from Austin airport in the RV. The RV is large, lots of room and quite comfortable….5 people could sleep comfortably. • Seejo and Ree take turns in driving through Texas , Litty and I get together a pile of romance novels to read along the journey. • It is a long long drive to the KOA campground in New Mexico from Austin . We reach there at around midnight. • We sleep in the RV- it was cold but comfortable! • We are impressed with the facilities at the KOA campground especially the ultra clean restrooms. • The first stop of the day was Carlsbad caverns . They were humongous caverns both in area and total volume but not as pretty as Luray. All the formations were more gigantic and there were some formations that were new to us, popcorn formations, drinking straw formation and lions tails. • Seejo falls down fro the upper birth in the middle of the night. The RV was still intact! • We started the day by clicking photographs of Mia at the Benson campground. It was a prettier campground but not as clean as the one at Carlsbad . • First stop was the San Xavier Del Mac Mission, an old Catholic mission aimed at preaching to the local Indians. Its like a big white structure which stands out against the stark desert-like landscape of Southern Arizona . There was predictably a cross on top a nearby hill for those who want to “earn” their prayers! • Brief stop at the local road side stalls to have fried bread – local specialty almost bhatura like in taste to be eaten with chili. We also tried the trip and corn soup but that wasn’t that much of a hit. • Next destination, we drove through the Saguaro National Park to see really tall cactus. They grow slowly, each arm takes about 75 years to develop. We marvel at how old the 5 armed ones are. We also love the various colors of cactus—pink, purple , yellow! • Next we drive upto the Catalina scenic highway to Mt Lemmon. Mia got her first taste of snow at Mt Lemmon. We stayed there to see the sun set and the full moon rise up on the other side. • Drive back through Tucson to Phoenix and crashed at Seejo’s friends place. Sanjay and Anju prepared Indian pasta with a wonderful cream of coriander soup for us! • We drove along the cactus filled landscape to see the Montezuma Castle to see natural cave like structures where native Americans built dwellings in. I can’t believe they would climb up all the way with water and other groceries! It is like a 5 story house that housed about 50 people, the rooms were built keeping in mind the natural formations of the hills. • Sunset and dinner near beautiful Sedona with houses having warm terracotta walls. We stayed in the best western in Paige. • Exchanged gifts at midnight, Mia loved jumping up and down the half unpacked suitcases. • First stop on Christmas day, the Antelope Canyon , narrow slot canyons with several beautiful shades that change as the light inside changes. • Monument Valley – the inside of the park was closed for Christmas but we did manage to take some good external shots, despite the biting cold. • Acomo Pueblo , the next day morning to see the oldest continous native American settlement. It was situated on top of a tiny hill and actually had people living there without electricity, running water etc. Of course they have bottled water, generators and lots of fancy cars! Casinos pay big money J . We weren’t allowed photographs as it was during the Christmas celebrations. But we could see the native dancing (deer dance and buffalo dance, I think). There religion was an interesting amalgamation of Christianity and nature worship, they had their own governing rules, a matriarchal society At every nook at corner , the locals were selling hand made pottery—exquisite work but prohibitively expensive. There was a guided tour to show us the Pueblo which is still home to 5-10 families. • We spent too much time there to see the Bandelier monument, so we next reached the Sandia Tram Parkway in Albuquerque , rode up the tramway to the top of the mountain to see the glittering vast expanse of the city below. • Mia enjoyed the snow-time very much. • Drove to see Santuaro di Chimayo church, one of the oldest Catholic churches in US, a very tiny but pretty church. The entire church was surrounded by so many crosses. Also every room around was adorned with garlands made of red chillies. Very stark against the light white snow sprinkled all over. • Loretto Chapel with the magic stairway. When the church needing a staircase in the chapel, legend has it that St. Joseph himself displayed his carpentry skills by creating a magnificent staircase in a restricted space. • Met up with Ketan & Sheetal and some weird chocolate mixtures. • Boca del Apache : Bird sanctuary with thousands of wild geese, a single falcon and cranes. Mia loved the birdies and was all ready to run off and play with them. • Cops pulls over Ree for alleged speeding, while on our way to Sonoma . There is something about me in the passenger seat that makes cop pull over! • Brief stop at Litty’s school. • Sushi dinner, at a new Japanese restaurant in Austin . Excellent aahi tuna and some super sushi rolls. • Lots of tacos at the Taco Deli where we sampled almost everything on the menu! • Back home after a great 10-day break.